Say goodbye to desk wobble for good. With the UPLIFT 2-Leg to 3-Leg Conversion Kit, you can easily turn your adjustable height desk into one that's stable enough to secure all of your desktop gear. 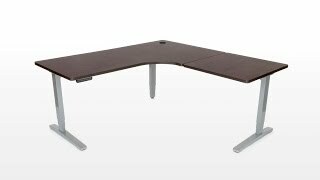 Rest assured that you have options for transforming your rectangular desk into an L-shaped workstation with the quick addition of a leg that elevates and uplifts your work style. The 2-Leg to 3-Leg Conversion Kit comes with an additional lifting column or leg, mounting bracket, connecting wire, control box, and optional switch so you can use your current UPLIFT 900 base without having to purchase a new one. Choose the color to match your existing two-leg desk frame. Your original UPLIFT keypad will work with this conversion kit, but if you would like to upgrade or choose a different keypad, select the Push and Hold Two Button Up/Down Keypad or the Advanced Digital Memory Keypad with 4 Memory Positions and Digital Height Display for a quick, easy adjustment to your saved positions. In order to meet an unforeseen high demand for our 3-leg desks, our team is manufacturing a limited expedited production batch of our 3rd legs at a higher cost. Because we know you might need your desk sooner, we can ship your order mid-February instead of waiting for our normal production batch to be ready to ship in early March. However, if you don't mind waiting until early March for your order to ship, we'll pass our $50 savings on to you! All you have to do is select Normal Lead Time and you'll save $50 on your new desk. Choosing this option will make your desk ship a few weeks later. This product comes standard with a 7-year warranty. $425.00 List Price: $635.00* The list price is the same as the MSRP (Manufacturer's Suggested Retail Price). It may not necessarily be the price at which the product is sold.